All the ingredients for a memorable wedding are right here. Starting with surf, sand and sun. Whether you're planning a small, intimate affair or a huge gathering, OC is the ideal setting. You won't find a more romantic or family-friendly atmosphere. Visit our Beach Weddings page to get details to help you start planning the beach wedding of your dreams. There are an unlimited number of things to see and do in Ocean City and getting to and from those destinations and attractions is easy, thanks to our many public transportation options. From the B Bus to the Boardwalk Tram and Shuttle Services, you can get around safely and without the hassle of driving or walking. Visit our Getting Around OC page for more details on the best way to Get Around OC while you visit! Check out our General OC Information page to find a complete listing of important addresses and phone lines for emergency information, facilities, local departments, parking lots, restrooms, houses of worship, parks and playgrounds and more. A quick drive. A short flight. 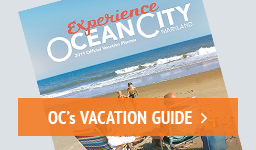 However you choose to travel, it's easy to get away to Ocean City, Maryland. Check out our How to Get to OC Fast page for your fastest route to a relaxing stay. Ocean City has worked hard to ensure that parking is accessible for our visitors. Parking is available in city lots, private lots and on certain public streets unless otherwise noted. In addition to cash and credit card options, you can now pay for parking using ParkMobile, an easy-to-use app that allows you to pay straight from your phone! View our Parking Information page for full details on parking options that will help make your trip to OC easier! Ocean City is a smoke-free town. Smoking is prohibited on the beach and boardwalk except in designated smoking areas. Please abide by our laws and respect the visitors and environment. Visit our Smoking Rules page for full details on rules and regulations. In Ocean City, we take safety very seriously. After all, we want everyone to have a pleasurable, safe and fun vacation. Please read our town ordinances, designed with your well-being in mind and to keep you and your family safe. More information can be found on our Town Ordinances page.